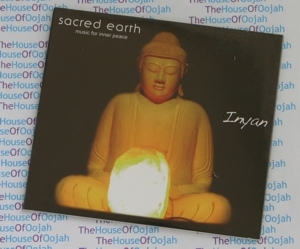 Ideal for Massage, Healing, Yoga, Meditation, Inspiration and Relaxation Inyan is Sacred Earth's third CD and has a lot to live up to! The band's first album Pamanyungan was recognised as album of the year in the Queensland 2003 music awards, and their second album Divine Devotion was considered by many to be New World Music's best release in 2004. If you like the first two albums, you are going to love Inyan. The quality of production, instrumentation and the melodies are world class. It is truly a sublimely beautiful album which has been inspired by Prem and Jethro's extensive practice of Yoga and Meditation. Based in Australia, Sacred Earth is the creation of Jethro & Prem Williams. Jethro & Prem have been traveling the world for 6 years performing live the music of Sacred Earth. Prem shares with us her heart felt devotion for Spirit and our precious Mother Earth through mantra and songs from the heart. Prem is supported by multi instrumentalist Jethro Williams, playing an array of flutes from around the world including Shakuhachi (Japanese flute), Indian Bansuri, Irish Tin & Low whistles, Acoustic Guitar and songs from the heart. Their music is used extensively throughout the world in the massage, yoga, mediation, healing, spa & film industries to evoke a feeling of well-being, peace, and ambience. In 2004 Sacred Earth began touring Australia wide, offering sacred music concerts. In this short time they have been embraced by the Australian Community and now often play to sold out concerts around Australia. Their music is awe inspiring, uplifting and takes the listener on a deep inner journey. The stillness that is discovered during their concert performance is profound. Often moving listeners to tears by the shear beauty of the music. Sacred Earth is regularly heard on Sacred Sounds Radio, which is broadcast live from Los Angeles, as well as many alternate Australian radio programs. Sacred Earth is leading the way for sacred music within Australia and are held alongside the likes of the industries best sacred music artists. The production and presentation of their albums is world class and upheld by their professional & breathtakingly beautiful live performance. Prem & Jethro Williams who are Sacred Earth love their life and the gift they have been given to bring to the world. These two performers are set to take flight across the world delivering nothing less than divine connection to the realm of the sacred.